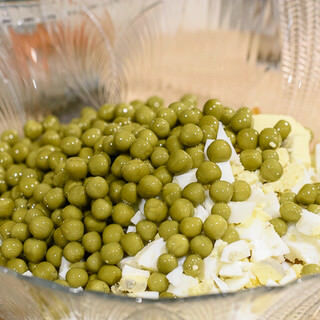 Russian Salad, also known as Olivier (also known as – салат Оливье), is a staple salad in almost every family from ex- Soviet Union. I read that it is actually very popular in other European counties, including some in middle east, too. It is rumored that Olivier salad was invented by a Russian chef of Belgian descent, Lucien Olivier around 1860s. Lucien worked for a very highly regarded, posh restaurant called Hermitage in Moscow. Just like many recipes from that time, Olivier recipe was a very big secret and no one could mimic it, until Lucien’s sous-chef Ivan Ivanov sneakily copied the ingredients from his boss. Ivanov ended up quitting Hermitage and left to work as a chef to a rival restaurant called Moscow (Moskva). He later introduced his version of Olivier Salad, which they renamed to Slotichniy Salat (Capital Salad). While it was a close match to the original Olivier, apparently people still felt the difference in the sauce and called Stolichniy Salat a second best to its predecessor. When I read the original ingredients for this salad, my jaw slightly dropped in amazement. 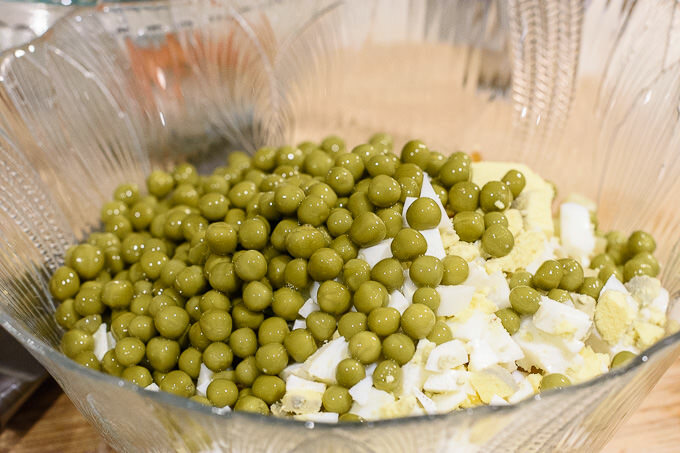 What I call Olivier Salad today has about 3 ingredients in common with the original one. It has been altered so much and understandably so. During the Soviet Era not many people could afford buying crayfish, caviar and many other fancy ingredients, which went into the preparation of the original salad. What we make today is by all means a dumbed-down version of the first. But nevertheless a very delicious one. You can read more about it in your spare time. I on the other hand will try to make the original Olivier sometime soon too see if I would like the peculiar taste of it. Let’s see what Russian Salad is like today. It is a fairly simple recipe. 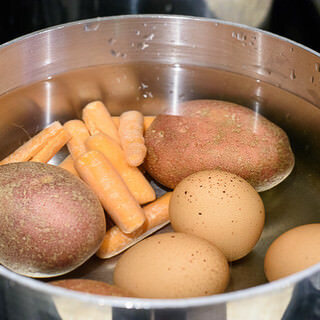 All you’ve got to do is boil, dice everything and mix all the ingredients together. There are some optional items which you may want to include, if you like them along with Mayo. There is no harm in that. 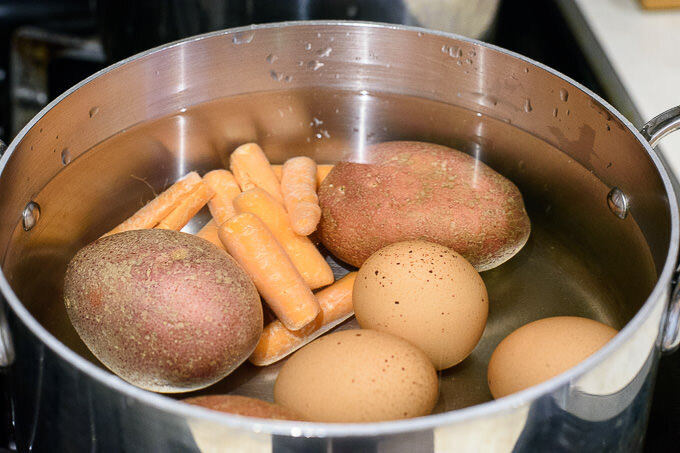 Put all the ingredients to boil and turn the heat off when everything is cooked. 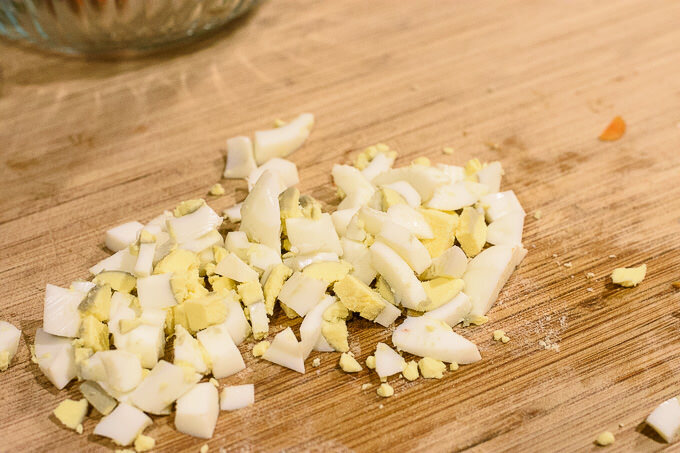 Discard the shell from eggs. 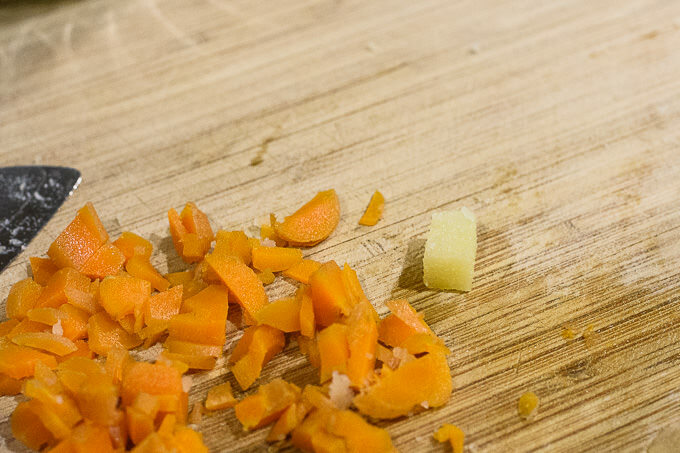 I also like to peel the carrots before they go into cooking. 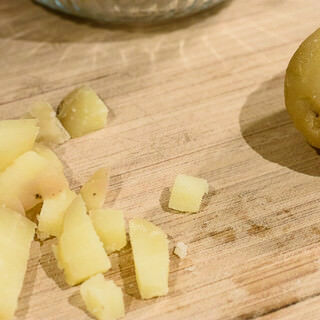 Potatoes, on the other hand, I wash thoroughly and leave the skin intact for cooking. 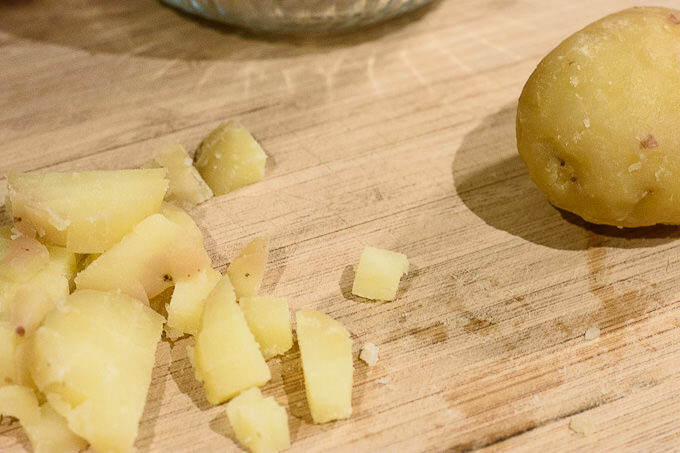 I peel the skin off after the potatoes are cooked. Leaving the skin on keeps the potatoes in one piece, even when slightly overcooked and potatoes actually taste much better when cooked with skin. Don’t mind the darker color at all. On the side of caution, please do not overcook the potatoes, as they turn the entire salad into a big giant mush at the end. I love this salad with beef rather than with just bologna. But if you are short on time, anything works, really. Salt the water of the beef according to your taste. 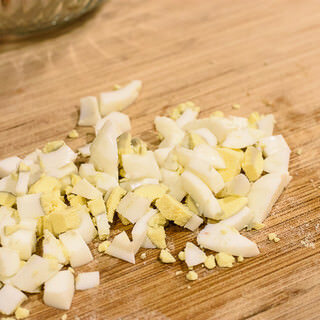 Doing so brings out the flavor in meat and also adds a great taste to the salad. 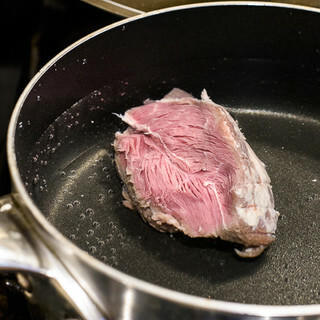 My sister swears by soaking the meat in cold, somewhat salty water after it is cooked. You can try that out, too. Dice all the ingredients. 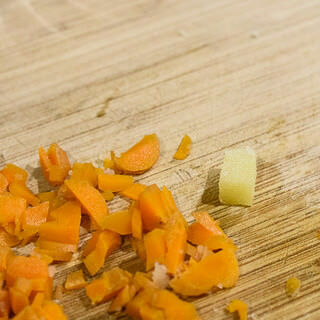 I dice the carrots a little smaller than I would potatoes. Put all the ingredients in a large bowl. Dice eggs as big as you would potatoes. You need to feel the taste of eggs in this salad. Also dice the boiled meat here. 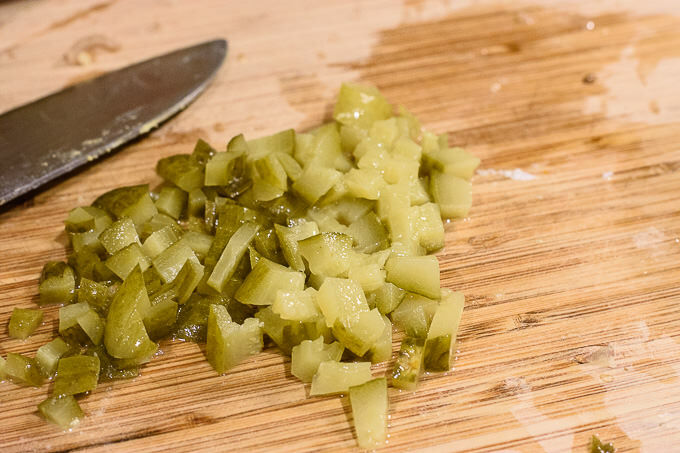 Dice the dill pickles and along with mayo add to the bowl with other ingredients. Here you can add the dill, a little bit of mustard seeds and all the other optional ingredients. My mother-in-law also adds apples, which I do not like very much. But for some it is a refreshing taste. Add salt and pepper as you wish and slowly mix the salad. Chill the salad before serving and let all the taste in ingredients blend. 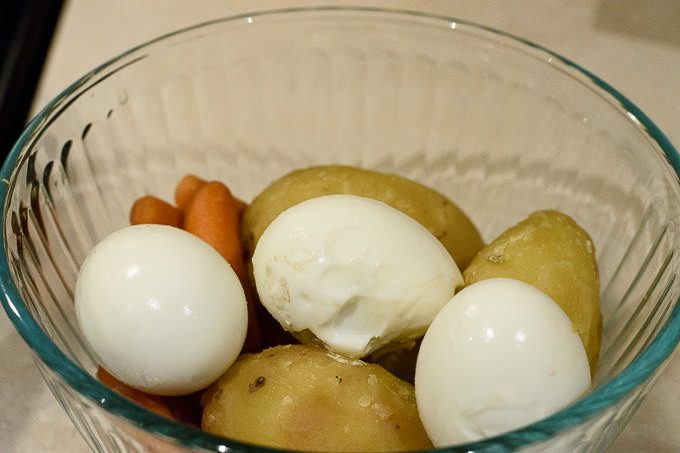 If you are making a double batch of this salad, I recommend not to mix everything with mayo. If I know I will not serve half of it, I keep one half unmixed in the refrigerator to prevent from spoiling early. 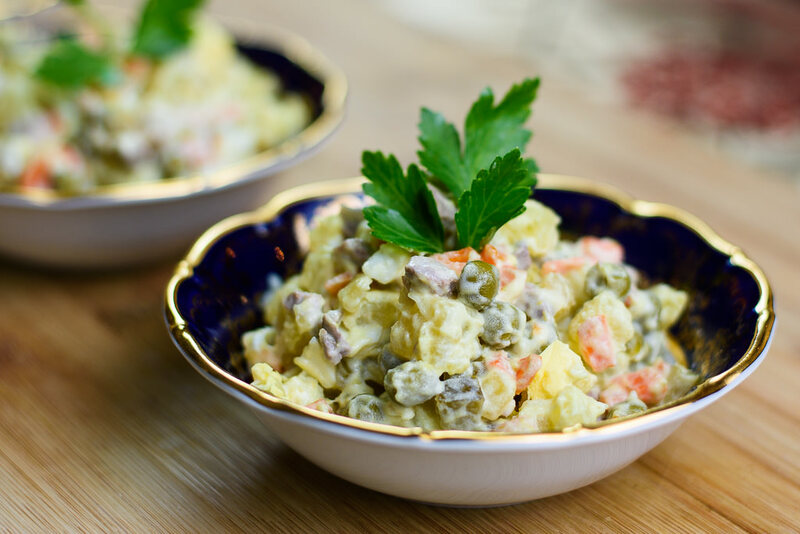 Russian Salad, also known as Olivier (also known as – салат Оливье), is a staple salad in almost every family from ex- Soviet Union. It is a fairly simple recipe. All you’ve got to do is boil, dice everything and mix all the ingredients together. There are some optional items which you may want to include, if you like them along with Mayo. Dice eggs as big as you would potatoes. You need to feel the taste of eggs in this salad. Also dice the boiled meat here. I forgot to photograph the meat. I love this salad with beef rather than with just bologna. But if you are short on time, anything works, really. Salt the water of the beef according to your taste. 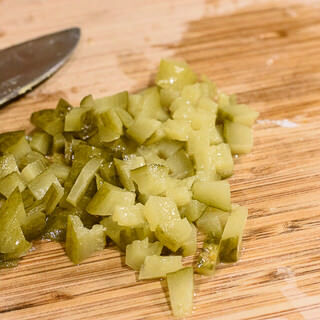 Doing so brings out the flavor in meat and also adds a great taste to the salad. 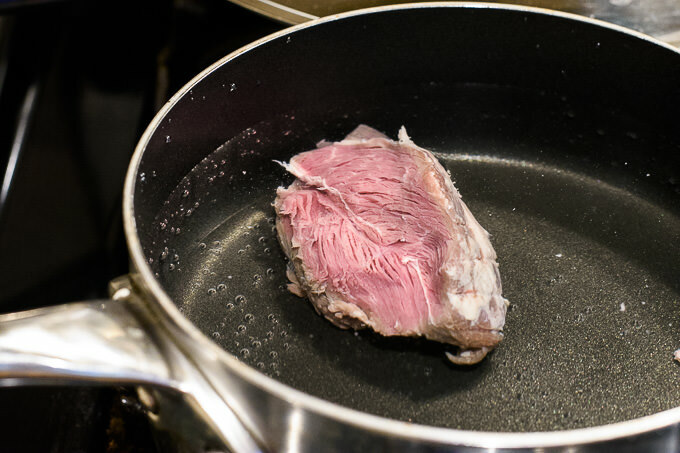 My sister swears by soaking the meat in cold, somewhat salty water after it is cooked. You can try that out, too. little bit of mustard seeds and all the other optional ingredients. My mother-in-law also adds apples, which I do not like very much. But for some it is a refreshing taste. Add salt and pepper as you wish and slowly mix the salad. Thank you for dropping by :) I hear ya! I love this salad, though. For some reason it never gets old, right? I love your blog, too! So colorful and so fresh. My best friend is from Moldova and I love her to pieces! So happy for finally finding you after couple of years. Your new blog is amazing with so many interesting and useful features. 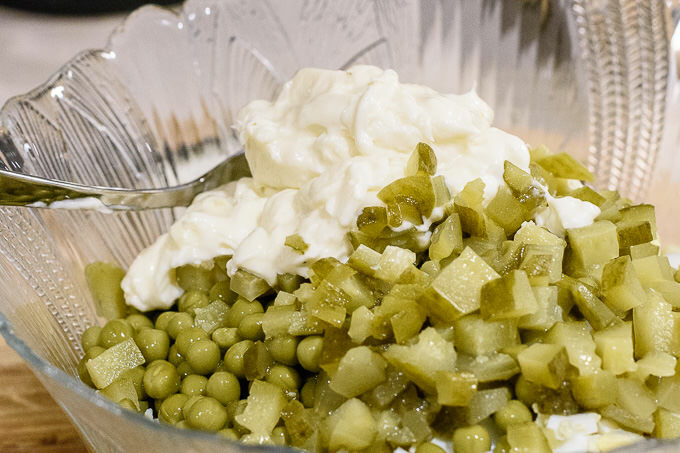 In the Middle East this sallad is referred to as “a russian sallad”. 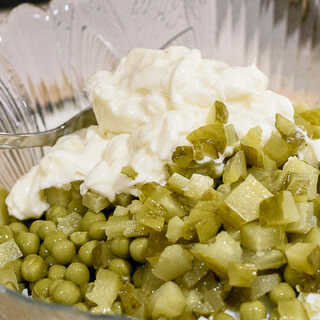 I usually add one green apple of “Granny Smith” sort to add some sour/sweet touch and my guests totally love this sallad. The girls from TKL have three groups on Telegram and one of them is dedicated to recepies and cooking so if you are interested I could add you to that group. We share our recepies from around the world. Love your work and dedication ❤️.